Tokens. A blog by Artist David Wills. : Art Martha. Shtetl In The City. Art Martha. Shtetl In The City. Dan Zollmann's exhibition called Shtetl in the City is an insightful photographic study of the Orthodox Jewish community in Antwerp. This compelling show gives audiences a rare glimpse behind the scenes, and is at times amusing thanks to Dan's clever juxtapositions of traditional culture against contemporary backgrounds in the city. 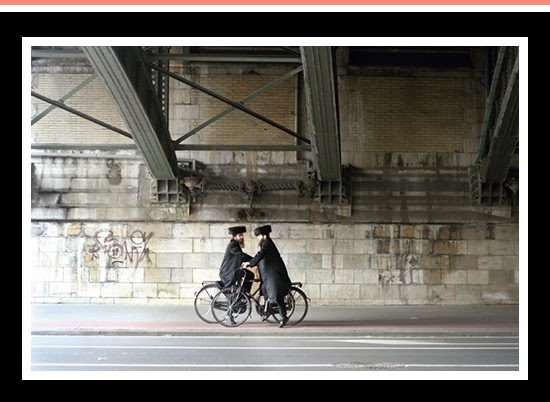 The image above is called Twee fietsen onder een brug — Two cyclists under a bridge — taken in 2006 and is just one of many great images showing now at the Joods Historisch Museum in Amsterdam. I'll be back for a repeat view, it's an outstanding show.